e-Swabhimani is an initiative of the ICT Agency of Sri Lanka aimed at recognizing excellence in digital content creation. e-Swabhimani 2010 Awards ceremony was held on 9th November under the patronage of Hon. Basil Rajapaksa, Minister of Economic Development. Mr. Lalith Weeratunga Secretary to the President was the Guest of Honour at this event. e-Swabhimani 2010 attracted nearly 163 nominations from all parts of the country. Winners were recognised under 11 categories. UCSC won in three of the categories and was also awarded certificates for two other projects. Language Technology Research Laboratory of the UCSC was awarded the e-Swabhimani 2010 award for the Project under the Inclusion category. 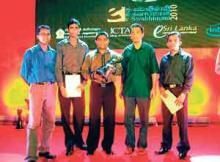 UCSC student project was awarded the e-Swabhimani 2010 award under the e-Health category. UCSC was also awarded a Certificate of Special Merit for the Shikshaka project of the Language Technology Group and a Certificate of Appreciation for the VLE Open Learning project of the e-Learning Centre. Both awards were under e-learning and Education category.